Steve Jones. Random House, New York, 2000. This is the book Charles Darwin would have written, had he penned On the Origin of Species by Means of Natural Selection today, rather than in 1859. In the more than one hundred years since publication of Darwins now-famous book, biologists have learned an enormous amount about how evolution happens. All of Mendelian genetics was worked out after Darwin, and all we know of DNA and molecular biology. Imagine how Darwin would have put this new information to use. British geneticist Steve Jones has. 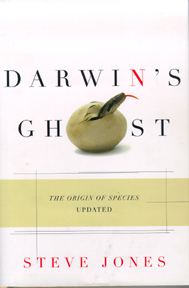 In Darwins Ghost he has rewritten Darwins book, keeping chapter headings, section titles and summaries, but recasting Darwins argument in modern terms, updated with the results of more than a centurys research. Darwin would have been fascinated with how molecular biology provides direct evidence of the truth of his theory, while the new complexities revealed at the DNA level would have delighted him. A must read for anyone seriously interested in evolution.